Just over two years on from releasing her 99¢ LP, Santigold has now revealed that new material is only a matter of hours away. 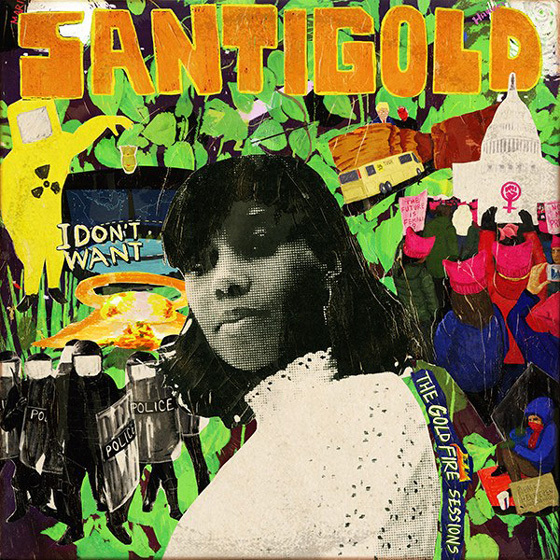 Santigold will release a dancehall mixtape titled I Don't Want: The Gold Fire Sessions tomorrow (July 27). A taste of what's to come from the effort can be heard with "Run the Road" in the player below. UPDATE (7/27, 12 a.m. EDT): You can now stream all of I Don't Want: The Gold Fire Sessions down below. The laid-back collection was made alongside Mixpak Records boss Dre Skull, and is said to prove "that Santigold has no shortage of compelling social commentary, even when she's in poolside chill mode." Santigold spoke to Pitchfork about her own discovery of dancehall, working with Dre Skull, making music with Diplo and Ricky Blaze and more. You can find some excerpts from the interview below, and can read the entire thing here. We used to go to Jamaica every year when I was 10 until I was 16, and I started going on my own when I was 18. It felt like a second home for me. I remember being a little kid and buying these mixtapes of local music; they had some amazing stuff on it. This song called "50 Dollar Bill," it's like [sings], "All I want, is a fifty dollar bill…" [laughs] I remember thinking it was so cool. I was really into Jamaican music—my dad played it in the house all the time. Then I was an African-American studies and music major in college at Wesleyan, so I learned about the history of music from an ethnomusicology standpoint. I studied a lot of Jamaican and African music and how they crossed over—how Jamaican music drew from African music. I've loved it for a long time, basically my whole life. We met in a writing session for another artist. We just started talking: "Oh, you like this music? You like this song? Let's do something together." It was really fun. I found him so easy to work with. He has such good ideas and instincts. That's what I wanted it to be: "I like you, you're fun, you like the same music, so let's do something really quick." I think I'm going to keep doing that for a while, rather than focusing on big, whole projects. I don't think people necessarily digest music in the same way. So I'm going to do fun stuff for a minute, a different way. It's not political. It's more social commentary. Politics are wack—it's mostly about the characters instead of the issues, like how religion is about religion instead of spirituality. But I think a lot of the issues playing out in politics right now are super relevant, and I care a lot about them. There's a song called "Coo Coo"—it's a very feminist song about being annoyed when guys try to catcall you on the street. There are also a lot of songs that feel really light. It's a summer reggae record, too.